We are closing in on the final release of Chapter IV, hope you guys are looking forward to that. Releasing the 20th of December! Regarding that being said, the holidays are coming and I want to you as a follower of Warrior Legend manga and the website. 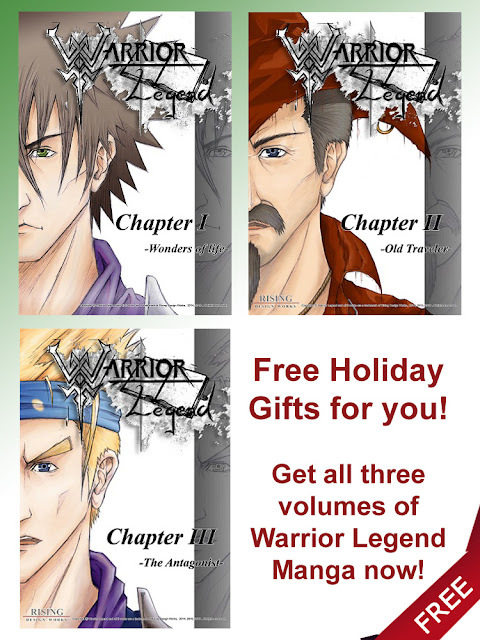 For your support to give you FREE samples of all 3 chapter of Warrior Legend for your phone or tablet this week only! Get your free copies while you can and prepare your to mind for the Warrior Legend IV later this month. Hopefully, you can take a little bit of your time to leave me a review on any of the chapters, that be lovely. If you do, let me know and I'll reward you with a Free PDF of Chapter IV. Hope to see you around for more, take care!